Last year My Beautiful, Perspicacious Wife and I and a couple friends attended a show by bluegrass supergroup I’m With Her at Thalia Hall. Midway through the show, after a rousing number, as the crowd applauded the all-female trio, some male knucklehead in the balcony nosebleeds thought it a fine time to holler god-knows-what in the direction of band member Sara Watkins. I couldn’t make out what he was saying; no one around me could make out what he was saying; Sara Watkins couldn’t make out what he was saying. When his noisy mush-mouthed blather concluded Sara Watkins waited the perfect comic pregnant pause and then said into the microphone with this strained sort of voice as honest as it was humorous: “What?” The crowd laughed so loudly in unison that we drowned out whatever this dufus bellowed as a response Sara Watkins didn’t want to hear anyway. And I thought, That Guy. Every concert has That Guy. A few years earlier when My Beautiful, Perspicacious Wife and I saw the incomparable Nikki Lane at the Double Door (rip) some mostly bald, middle-aged moron in a black leather jacket kept hollering at Ms. Lane, like he was 22 and thought he was going to hook up with her after the show, when he wasn’t pointing at the guitarist after every one of his soloes like the two were axeman contemporaries. The guitarist deftly evaded eye-contact. At the turn of the century, at The Landing in St. Louis, when I was sitting in the grass listening to some band play a free show, I became so disgusted that they chose to play “Superman (It’s Not Easy)” (there is backstory I will not delve into) that I vocally announced my displeasure with their choice of cover. My friend Daryl then incredulously advised: “Uh, Nick, I think that’s their song.” Hells bells, it was. Five For Fighting, at the peak of his power, was playing a free stage, and I was mocking him for playing his own song. Some guy I didn’t know sitting nearby actually commiserated on my behalf that he didn’t know it was really Five For Fighting either. Still, if I’d been closer to the stage and Five For Fighting had decided to heckle me, I would have had no choice but to sit there like the idiot I was and take it. I, readers, was That Guy. The climactic moment in Richard Linklater’s critically appreciated yet somehow still significantly under-valued “School of Rock” (2003) involves a band of musically gifted kids under the command of their metal axeman masquerading as teacher (Jack Black) playing The Battle of the Bands. They knock the gig out of the park. They are the clear winners, but, like Roy Jones Jr. inexplicably losing the Light Middleweight Gold Medal boxing match at the 1988 Olympics, lose out to the piffling No Vacancy. The crowd is chagrined. Well, not the whole crowd. 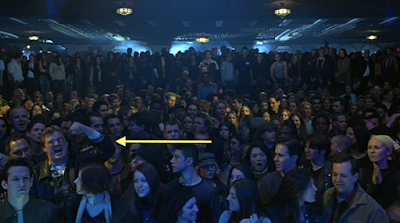 As No Vacancy’s victory is announced, Linklater cuts to a wide shot of the audience, presumably to breathe in the pall that has just been cast. But one person, near the foot of the stage, over to the left of the frame, goes hog wild. On the DVD commentary track, both Linklater and Black reference this dude. Black even calls the moment one of his favorite in the movie. Neither of them, however, indicate this was planned. Linklater, in fact, says that working with such a large crowd often results in unexpected moments of spontaneity. Many filmmakers, I reckon, might have edited this out, or before the next take told this extra to zip it. But Linklater, bless his heart, left the moment in. He knew what that extra was doing, and Black did too. That extra decided, in the moment, to make this concert feel truly authentic; he decided he would play That Guy.